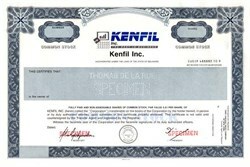 Beautifully engraved SPECIMEN certificate from Kenfil, Inc. This historic document was printed by Thomas de la Rue and has an ornate border around it with a vignette of the company logo. This item has the printed signatures of the Company's President and Secretary. Ameriquest Technologies, Inc. is a national distributor of high-end computers, sub-systems, peripherals and software focused on value-added reseller and systems integrator wholesale channels. The Company markets hardware products for the personal computer market. Ameriquest currently markets more than 2,000 products to original equipment manufacturers throughout the United States and in many foreign countries, including national and regional distributors and large integrators such as Intelligent Electronics and ENTEX.